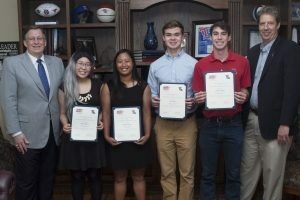 Four Louisiana Tech University students have earned a CyberCorps Scholarship for Service (SFS) award for the 2018-19 academic year. Kimberly Atienza (computer science), Joseph Bingham (cyber engineering), Kaelyn Nguyen (computer science) and Ryan Parker (computer science) earned the award for excellent academic achievement and commitment to a career in cybersecurity. The CyberCorps SFS program is funded by a $3.5 million grant awarded by the National Science Foundation. The grant will be used to prepare future cybersecurity professionals for entry into the government workforce. On graduation, SFS recipients must serve at a United States government agency in a cybersecurity position for a period equivalent to the length of the scholarship. The Louisiana Tech Computer Science and Cyber Engineering programs provide students with the necessary training to be successful in cybersecurity fields. One opportunity for hands-on experience students in these programs can get is the Louisiana Tech Cyber Storm. Cyber Storm is an annual daylong cyber security competition in which teams of students try to hack other teams’ systems and defend their own networks from intrusion by other student and administrative teams. The CyberCorps SFS Scholar program will provide scholarships to 36 Louisiana Tech University students over a five-year period. Eligible students must be enrolled in either the Computer Science program with a Cybersecurity concentration or the Cyber Engineering program, have a junior standing or higher and maintain a 3.0 grade point average. To learn more about the Louisiana Tech program, go to http://coes.latech.edu/students/cybercorps-scholarship-program.php.